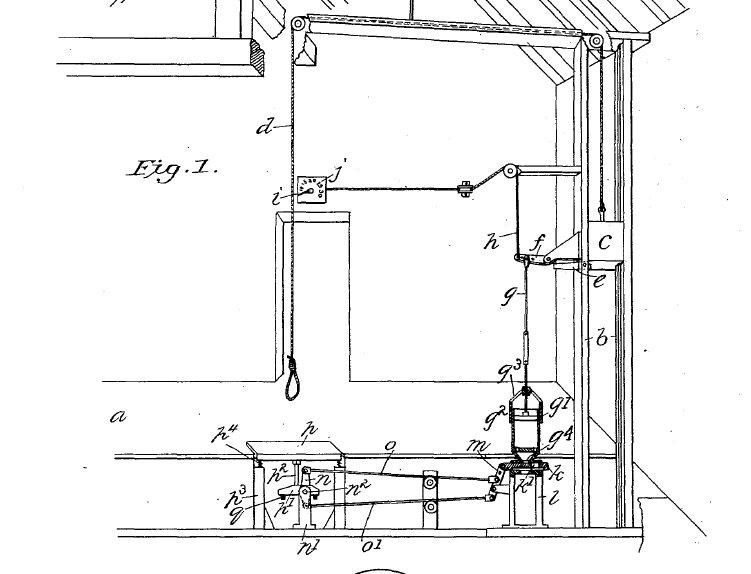 On June 18, 1895, Jabez L. Woodbridge of Wethersfield patented an automated gallows. The object of Patent No. 541,409 was “to provide an apparatus or machine by means of which the penalty of capital punishment may be inflicted with certainty.” Not only was Woodbridge a resident of Wethersfield, he served as Warden of the Wethersfield Prison from 1893-1899. At its opening in September 1827 the newly constructed Connecticut State Prison housed 81 inmates previously held at Newgate Prison in Granby. It closed in 1963 when a new facility in Somers was built. Woodbridge, Jabez L. Patent Number 541,409 - Automatic Gallows. 541,409. Wethersfield, CT, issued June 18, 1895. Link. “View of Wethersfield Prison, Wethersfield,” ca 1880. Connecticut Historical Society. Link.